Beginners should head up the mountain to Sportinia, which despite an abundance of red runs, provides many opportunities to ski wide, open pistes ideal for building your confidence. Sportinia is also the location of the ski school meeting place and the sunny, sheltered nursery slope is ideal for complete beginners. After just a few day’s tuition you could be enjoying the runs through the woods back to the village. The number 30 from the top of the Sportina chair to the bottom of the Clotes chairlift is a particulary pleasant blue run. Sauze d’Oulx is an exceptional resort for intermediate skiers. There is a fantastic range of cruising terrain ideal for improving your technique and building your confidence. As a result, snowboarding is also a popular past time. We like to head up to the top of the Moncrons where the red pistes are generally less crowded. Intermediate skiers can cover significant distances and there is varied skiing, both above and below the tree line. You can easily access the three main areas of Clotes, Sportinia and Genevris using the interlinking lifts. It is also simple to ski to Sestriere and the enjoyable runs of Sansicario. Travelling to Montgenevre, across the Italian/French boarder is a great day trip. The French resort is also a part of the Milky Way area and well worth a visit. Our favourite piste on the mountain is the Olimpico. Take the chairlift to the top of Mount Fraiteve, from here a mixture of red and black piste drops all the way into Sansicario village. This long and challenging run will really put your stamina to the test! The black Malafosse is another exciting run where the narrow piste requires excellent control. Runs on this side of the mountain generally offer longer descents, giving advanced skiers and boarders something to get their teeth into. The Milky Way area also provides several opportunities to ski off-piste. Free riders can head to the Moncrons, which has possibly the best powder conditions on the mountain. Montgenevre, across the French border, has an excellent reputation for its off-piste with some iconic routes. Advanced skiers will enjoy neighbouring Sestriere too. The higher resort offers several steep, challenging blacks as well as dedicated mogul fields. Sauze hosted the freestyle competitions during the 2006 Turin Winter Olympics. A small terrain park is located above Sportinia and you can find another park in the neighbouring resort of Sansicario. This popular hotel could not be better situated. Enjoying a ski in/out location with beautiful mountain views and a reputation for serving hearty Italian food. 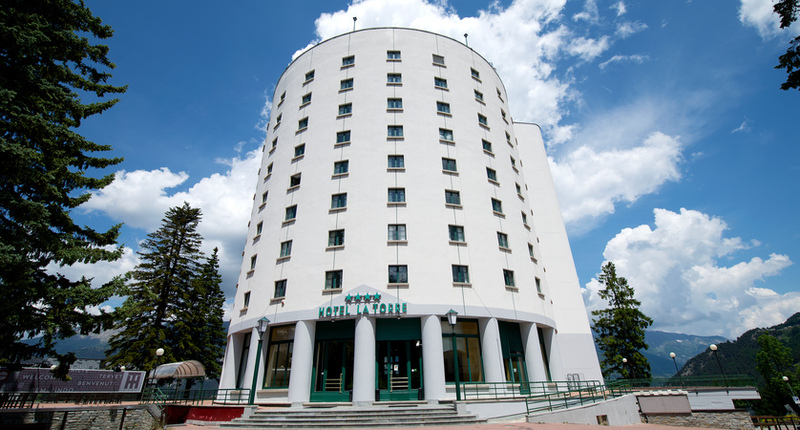 Located on the edge of Sauze, the Hotel Gran Bosco is a traditional family-run hotel offering great value and a good standard of accommodation. It is located 900m walk from the centre of the resort. Free shuttle bus provided to lifts. This stylish hotel offers high quality accommodation and facilities with stunning views over the Susa Valley. Free shuttle bus service to lifts at set times. 1 minute's walk to the ski bus stop, 10 minutes' walk to the Sportinia chairlift. 8 minutes' walk to the resort centre through the picturesque old town. Iconic landmark hotel with spectacular mountain views. 500m to the Clotes lift (shuttle service provided) and a short walk to the resort centre. La Torre offers high quality accommodation and facilities. Enjoying a prime position on the Clotes piste, Hotel Chalet Del Sole is in traditional chalet style. On a natural terrace overlooking the Susa valley, this hotel benefits from excellent views and a ski in/out location. Free Ski Upgrade Offer Book 'Blue' skis and receive 'Red' skis. Book 'Red' skis and receive 'Black'. Eating out on the mountain needn’t be an expensive experience in Sauze d’Oulx. The Clot Bourget is one of our favourite mountain restaurants and it is excellent value for money too. Slightly off the beaten track, the Clot Bourget serves a good selection of Italian style food. The Capanna Kind is a lively and friendly bar/restaurant on the mountain. The glorious sun terrace is a great place to enjoy a pasta dish or pizza for lunch. Regular live music makes this the ideal place to start the day’s après ski too! In the centre of Sauze’s old town there is a wide variety of charming restaurants serving rustic mountain food and typical Italian dishes. Il Cantun del Barbabuc on the main street specialises in using local ingredients, it also has a fantastic wine list! One of our favourites, the Del Falco has a fantastic menu and the incredible daily specials are delicious. We highly recommend the roast loin of pork with wild mushrooms. Not only do we rate the food highly, the staff are friendly and always make us feel welcome. Sauze’s reputation for lively nightlife and a thriving après ski scene is certainly justified. There is a wealth of pubs, bars and clubs, which lend the resort a definite party vibe. The scene has a sophisticated side too and it’s certainly possible to find somewhere for a chilled drink at the end of the day. One of our favourite après spots, the Miravallino is a friendly and inexpensive bar in the centre of town. Reasonably priced food and drink, and regular live music performed several times a week enhances the already lively atmosphere. Another favourite of ours is Il Lampione wine bar in the centre of town. Popular with the locals as well as with tourists this is a relaxed destination perfect for enjoying a lovely bottle of wine and nibbles, especially when accompanied by the occasional live music performance. On the more boisterous end of the après spectrum is the Sport Cafè, which has a consistently lively atmosphere. Anywhere that does free pizza tasting sessions must be good! This is a great destination for anyone looking to watch sport, sing karaoke or stay up late into the night listening to live music. There are several supermarkets in resort, ideal for picking up any essentials you might have left at home! You can hire your ski equipment and buy presents for friends and family at the many sports and souvenir shops. The distinctive Hotel La Torre has an excellent wellness centre complete with large indoor whirlpool. Guests of the hotel and visitors can pay locally to relax in the steam room or the sauna. Beauty treatments are also available to guests to buy. The spa at the Grand Hotel Besson offers an extensive range of wellness facilities. Highlights include the salt-water spa pool and the external hot water plunge pool – best enjoyed with a glass of Prosecco! Not staying at the Hotel Besson? Visitors to Sauze d’Oulx can pay locally to use the fantastic facilities. It’s perhaps unsurprising that this lively town has such a festival spirit. Live bands frequently perform on the mountain or in the main square making it consistently exciting in Sauze d’Oulx. The highlight of a busy and eclectic events calendar is The Sauze Carnival. Taking place around lent, carnival is an Italian tradition and the streets of the old town are flooded with floats and costumed participants. Events in and around resort also celebrate Christmas and New Year. Particularly notable is the end of year Torch lit procession and fireworks display. The local ski instructors accompanied by fireworks and music herald the New Year with an on-piste torch display. It’s not all about the après in Sauze – there are plenty of other activities off the piste that can be enjoyed by the whole family! And if there’s too much snow on the mountain, limiting your skiing, it’s easy to get out and explore the wider Piedmont region of Italy. Turin is beautiful, with elegant squares, tree lined boulevards and lavish turn of the 20th century architecture. A powerhouse of Italian industry, Turin is famously the home of Fiat cars but there is so much more to this dynamic, Italian city, from spectacular museums to the world-class football club – Juventus. Only an hour’s drive from Sauze or a short trip by train, Turin makes an excellent destination for a day trip and is the perfect getaway when the ski legs begin to tire! Speak to your Inghams representative for more information on how to get there. One of our favourite non-ski activities in Sauze, there are fantastic trails to follow throughout the resort as well as in nearby Gran Bosco National Park. Maps are available showing the trails and the local tourist office can provide information on the safest routes. With a variety of terrains to explore, there are walks suited to winter walkers of all abilities and experience. Snowshoes and hiking poles are available to rent from many of the local sports equipment stores in the resort. We love wine tasting in Sauze d’Oulx! The delightful Il Lampione is not only one of the most relaxed àpres bars in resort but you can also arrange to taste the many splendid wines that they offer too. The charming surroundings in the rustic bar are the ideal place to spend a gentle evening sipping wine with friends. Speak to your Inghams representative for more information about how to book this experience. Lessons start at 10am. 6 day beginner options also available.